The summer school will take place July 30 - Aug 4, 2012. The conference proceeding the summer school will take place Aug 6 - 10, 2012. The following hotels have reduced RWTH Aachen university rates. Most participants of the summer school will stay at the IBIS hotel. Exploration of automorphic forms goes back at least as far as 1748, when Euler wrote down the first theta function. Over the last centuries, various areas of mathematics and physics have contributed to the development of the theory of automorphic forms. Today, the subject draws techniques, problems, and inspiration from analysis, algebra, combinatorics, geometry, invariant theory, Lie theory, and representation theory; in turn, the theory of automorphic forms finds applications in various areas of mathematics and mathematical physics. Recent years have seen many exciting new developments and promising new directions of research in the theory and application of automorphic forms. 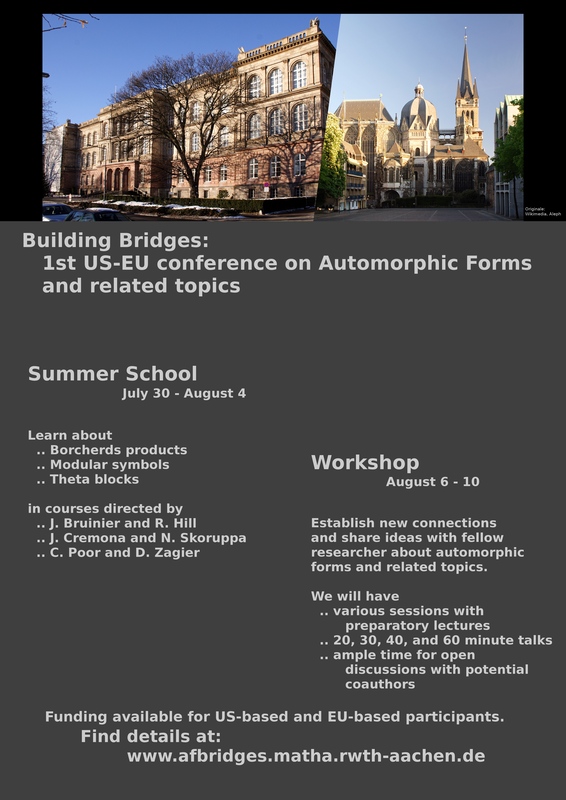 The purpose of this workshop is to provide a forum for researchers to share their results, techniques, insights, and speculations, stimulating concrete as well as speculative discussions, and establishing new connections, both between people and between ideas. Each session will begin with a preparatory lecture, providing context and background for the subsequent talks, and each presentation will end with speculations and at least one concrete open problem. Both the summer school and the conference are being supported by NSF grant DMS-1153219 and by the Graduiertenkolleg of RWTH Aachen University. For details see the respective pages about the summer school and the conference.